Moses, I am using just cheapo 10-40. A bit of history, I took this timing cover off a motor that I destroyed. #1 and #5 rods broke, destroyed the block broke the cam, timing gear ect ect. I am wondering if when the cam broke it may have jammed up the oil pump a bit. I just couldn't recall when I installed the high volume kit originally if it turned relatively easily by hand. I did use great care when I did the kit, using the spacers and such to locate the gears before I drilled for the spacer plate roll pins. I'm thinking a new timing cover and oil pump kit are in order. I'm pretty nervous about this one. Getting my 225 back together, not rebuilt, I just took it apart to look things over. Question I have is how difficult should my oil pump turn. I did put in a melling high volume kit a couple years ago, I just don't remember what it felt like. I wanted to confirm oil flow so I rigged up a priming tool, one handed is somewhat hard. I put it on my drill motor and it really makes the drill work to turn it. Definitely pumps oil (all the way across my garage) just a little concerned with the pump. Any thoughts? 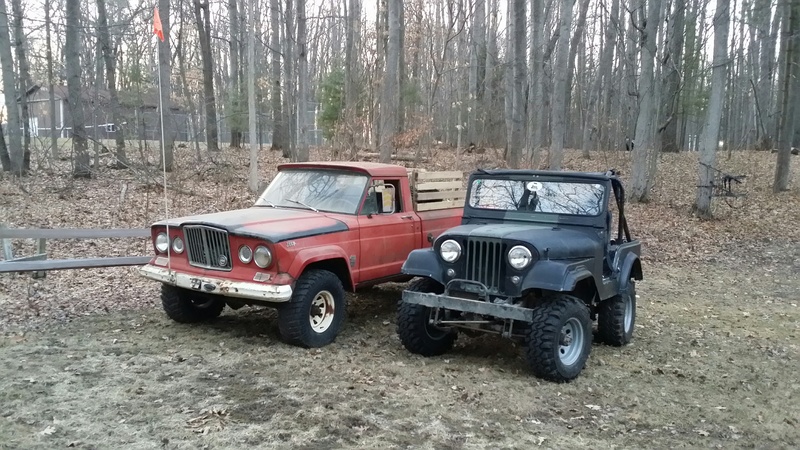 I swapped a 225 into my 59 cj5. I went with a set of Sanderson headers, sort of a block hugger style, only because my stock manifolds were junk. My brother did the same swap, on same year jeep and stuck with manifolds. I think his drivers side manifold was from a commando or something, it actually points to the back. There is zero difference between the two performance wise. Mine is louder for sure. I'm certain his manifolds will outlast my headers. I went with raw steel finsh and painted them myself with high temp header paint, about a hundred coats, wich is all gone replaced by nice looking rust. We both considered doing a holly 390 with a offenhauser intake, but it was going to be pretty expensive. That was what stopped us. Also Rochester 2gc carbs are literally everywhere..easy to work on and cheap too. What an honor! Thank you, Moses! I got to know you in my early 20's through my early cj rebuilders manual, building my 59 Willy's! (Ill toss a photo up in the vintage section) That manual is in pieces, covered in greasy fingerprints. I still reference it often! Your manual and Mr. Granville Kings jeep bible are my favorite reads! The gladiator is a fun rig, as usual a work in progress. The front closed knuckle 44 will probably stay, only because I have a spare. It does turn like a toboggan though. I am however collecting parts for a disc conversion, should be almost identical to a 25/27 setup. I love the modern gm ls engine, I am so glad I did the harness rework myself. It really opened my eyes to the general simplicity of those engines. I would highly recommend one to anyone considering a swap. I ditched the worm and roller steering, it reminded me WAY too much of the Ross and cam I was in such a hurry to replace on my willys! I used an intermediate shaft and rag joint out of a 70's wagoneer and a similar year power box. I used a AA power steering box mount, and some home fabricating to create a mount that angled the box correctly. In hindsight I should have just found a mount from a newer j truck. Oh well, live and learn. I also used a newer column out of a wagoneer with a sweet leather wrapped steering wheel! Luxury! I used a tank and pump out of a 99 2 door s10 blazer. It maintains the required 59 or so psi to my vortec. Makes for easy to find common parts too. I will keep adding to this as I make changes, Lord knows, there WILL be changes!